I was in deep, too deep. All of the clues led to only one conclusion. A conspiracy almost as big as the gourmet root beer industry itself, and one shadow organization silently pulling the strings. One wrong move and I was finished. How did it come to this? It all started two weeks ago. My sister came to town from Idaho for the weekend to attend SakuraCon. As she unpacked her things she proudly turned to me holding a large plastic bag and pulled out three stubby brown bottles with blue labels. “Boise Brew Game Day Root Beer” Score! I am always looking for a new root beer to review, and three bottles means I could even trade one with another reviewer should I need. But that would have to wait, SakuraCon was calling after all. I threw up a photo on Facebook and left it at that. Then last Monday, I finally got around to inspecting those brews, no ingredients nor nutritional information, curious. I wondered what Google had to say … nothing. Now that’s beyond just strange, that’s a mystery, a mystery root beer. Luckily I knew a fella in Jersey who could usually help out in a pinch like this, over the years he’d made his the biggest name in the root beer [under]world, Lil’ anthony. He was always willing to trade information for a new root beer, and if you were fortunate he’d send a brew back your way. I knew that extra bottle would come in handy. Lil’ anthony said he had never heard of it, said it might be a “private label,” and wanted to know more. There wasn’t any more to go on, but I told ‘im, I’ll solve this Case of the Mystery Root Beer or my name isn’t Dr. Percival C. McGillicuddy! The first thing was to interview the witnesses. I got my sister on the phone, I needed some answers. She had bought the brew from Kneaders in Meridian about a month ago, but then the dame there said they didn’t have any and didn’t ever remember seeing it. A quick call to the Kneaders corporate was brushed off faster than I could blink. Clearly somebody there wanted to make sure that root beer was “forgotten” and wasn’t too happy about a flat foot poking around. The only other clue was a small note on the labels themselves, “Dowdle and Daughters.com” a domain name that had expired on the day before I went looking. Whoever was behind this was always one step ahead of me. 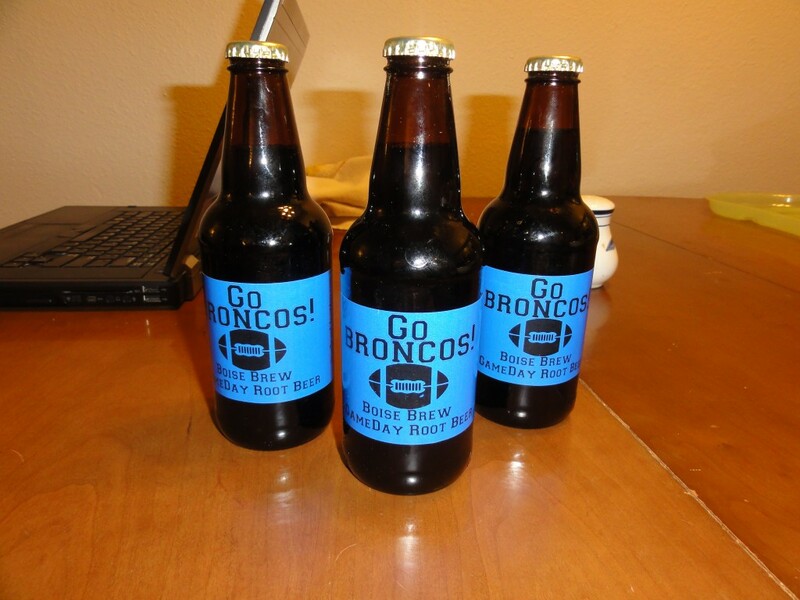 Some more digging led to a couple of blogs by Dowdle & Daughters and Bluebird Custom Sodas, each with different phone numbers but they shared a picture for “Game Day Root Beer” which had an identical label to the Boise Brew except the two root beers shown were Cosmo Brew and Ute Brew, appealing to the University of Utah and Brigham Young University. Finally, a solid lead. The phone numbers lead to answering machines, expected. After leaving the right type of message I finally got a contact, one of the Daughters. She said that their soda business had been sold off recently and gave me a number. “Ask for Mark or Josh” she said and left it at that. This brew was clearly too hot for anyone to handle long and she wanted none of it. The number went straight to the voice mail, but with the right message I was sure I’d get a reply. When you’ve been around the root beer world as long as I have, you pick up a few tricks. Josh finally called me back the next day. He said they ran Custom Soda Sales and let it slip that Boise Brew and Parley Street were one in the same, but they didn’t make it. The supplier was in Minnesota by the name of Excel. Except the problem was there is no Excel Bottling in Minnesota. There was one in Illinois, but they happened to be closed that day. Excel only seemed to bottle Frostie Root Beer, but Parley Street definitely wasn’t Frostie. A dead end. Somebody really didn’t want the truth to get out. I left another message for Josh and upped the ante. I laid it all out and said I needed answers. The next day his partner Mark finally cracked under the pressure and the two decided to come clean, they were supplied by Ginseng Up in Massachusetts. They gave me a contact number in exchange for protection. The first thing was to check this organizations public operations. With an appropriate tag line of “The Root of All Power” I knew I’d need to be careful. Nothing on the surface seemed to indicate there was anything to do with root beer. Their whole guise was a ginseng infused soda line with 8 different flavors. Root Beer was noticeably absent and there was nothing about private labeling. The contact numbers listed were not the one I received. If Ginseng Up was behind all of this, they didn’t want it known. I went undercover and used the number. A broad answered. I put on the charm thick and soon got that bird to sing. Yeah, Ginseng Up supplies the private labelers. They have their own recipe but they’ll also do “special requests” for the “distributors”. They have many clients. I got the info without raising suspicions. Now I needed a few more questions answered from Josh, and I’d have this case closed. Then Carl’s BBQ Root Beer showed up. It was in a stubby and tasted different than the Parley Street and had different ingredients listed. It said it was distributed by Teeroo’s and gave had a number listed. I knew what was coming. Next thing I know I’m learning about a private labeler in Texas, with their own unique recipe that started from a different private labeler in Florida until he “gave it up”. Ginseng, however was more than happy to continue supplying the recipe to the “independent” distributors. That’s when Josh got back to me and confessed that they just used Ginseng’s stock recipe. I wondered how many others did. I decided to check with Private Label Specialties, who do Cheers Root Beer and some others, probably one of the biggest private label rackets in the country. When emails went unanswered I decided to drop them a ring. The bird on the other end didn’t want to talk about their supplier and seemed nervous. So I just straight up told her that I knew about Ginseng and I wanted to know if they were using Ginseng’s recipe. Too surprised at that to think she stammered that they don’t use Ginseng’s recipe but have their own. It made me wonder if any private labelers aren’t supplied by Ginseng. I also wondered if they’d snuck anything else past me over the years. Looking over the collection thankfully revealed that I’d stayed clear of their influence until the last few weeks. Finally, all the pieces had fallen into place. Boise Brew is the exact same as Parley Street. They used to be labeled by Dowdle and Daughters but now by Custom Soda Sales. Ginseng Up supplies them with the Ginseng Up generic recipe. Teeroo’s and Private Label Specialties also are supplied by Ginseng, but each have their own unique recipes that Ginseng bottles for them. Case closed! But I was sure I’d cross paths again with Ginseng Up. They’re still out there after all, in the shadows, silently controlling the private label world of root beer. Though it’s dangerous, I have to keep the root beer world informed and bring this to light. Stay vigilant my friends, that root beer may not be what you think.